While members of Congress visited Fresno on Wednesday to discuss what to do about California's dwindling water supply, state Superintendent of Public Instruction Tom Torlakson announced that the drought is beginning to impact school enrollment. Less planting means less demand for farm work, and some of the families of migrant workers are moving from the Central Valley to where there is work. "'No water, no jobs.' We see those signs on the freeway, but that translates further to (if there are) no jobs, what are parents going to do? At a certain point they're going to leave," Torlakson told KQED's Central Bureau Chief Sasha Khokha in Fresno. Schools receive funding based on student attendance, so when attendance drops, revenue normally does, too. Torlakson said that the state will provide aid to local districts seeing declining enrollment because of the drought. While the state won't provide new money, it will provide the funding school districts would have received if students had not left. Torlakson said the California Department of Education will work with school districts and state senators to determine what districts experience an enrollment decline due to the drought. The superintendent said the drought is affecting students and their families in other ways, too. "We're also seeing the social impact of this crisis where families are doubling up. Farmworker families that have no work, two or three families are living in the same small space so those crowded conditions can lead to conflict, to stress, to the inability to concentrate and do your homework," he said. The House Natural Resources Committee was greeted by hundreds of farmworkers at Fresno City Hall protesting what they say are unfair water allotments. Some workers held signs that read, "Warning: No Water! No Food!" and, "Water — the hub of life." Chants of "Water! Water!" rang out in English and Spanish. Seven Republican members of the committee — and one Democrat — were on hand to hear statements from invited witnesses who mostly blasted federal policies relating to water shipments to San Joaquin Valley agriculture. House Republicans passed a water bill earlier this year that would impose sweeping changes on California water law and suspend endangered species protections for fish, among other measures, to get more water shipped quickly through the Sacramento-San Joaquin Delta. 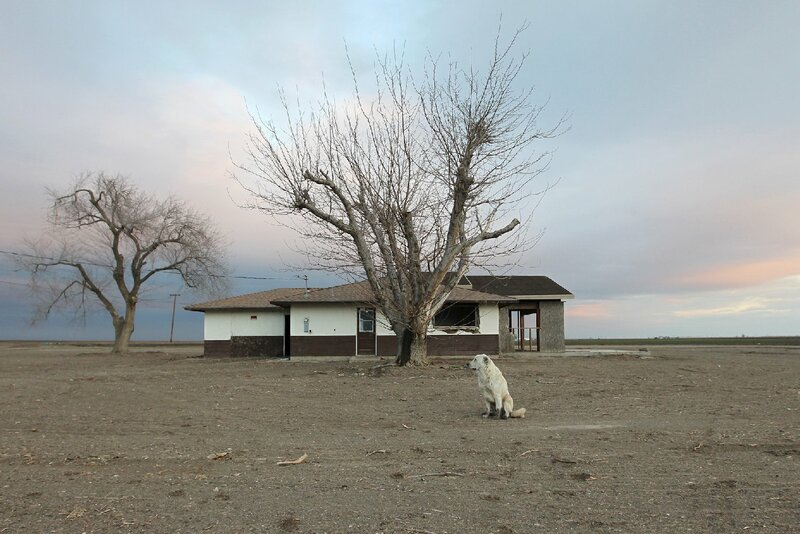 Democrats in the Senate have passed a drought relief package without those provisions but focusing on how to transfer water more efficiently among rights-holders and provide emergency relief to communities hurt by the drought. Rep. Jim Costa of Fresno was the only Democrat to attend the meeting. In a statement Tuesday, he called for a more bipartisan approach to dealing with the crisis. "It is my hope that we will hear more about common ground and solutions that will bring more water to this valley instead of rehashing the tired, partisan battles over California water," Costa wrote. But several California Republicans in Congress sent a letter on Tuesday to President Obama and Gov. Jerry Brown urging them to act now to get more water to the valley. Regulations aimed at protecting endangered fish allowed 445,000 acre-feet of water from February rains to be lost into the ocean, the letter said. House Majority Whip Kevin McCarthy, who was among 13 to sign the letter. "Given that communities in Central and Southern California are struggling to meet water needs and farmers are fallowing hundreds of thousands of acres of land that feed our state and country," the letter said, "loss of this water is absolutely unacceptable." Could a new reservoir help? In the town of Maxwell, in the Sacramento Valley, Democratic Rep. John Garamendi and Republican Rep. Doug LaMalfa announced a bill proposing to build a new reservoir north of Sacramento. With a storage capacity of 1.9 million acre-feet, it would be about the same size as the San Luis Reservoir near Los Banos. The proposal, which has been studied for years, is to wall off a remote valley just about halfway between Sacramento and Redding, and fill it with water from the Sacramento River when runoff is high. They hope construction can start next year. However, the bill would not guarantee federal funding for the reservoir, which the lawmakers say will cost between $2 billion and $3 billion, although they said federal money could be available later. Likely sources of money are local water districts that will benefit from the reservoir and a state bond that is being negotiated for the November ballot. This post contains reporting from Sasha Khokha, Craig Miller and Mina Kim of KQED News, and the Associated Press.